ENSTAR replaced an outdated and error-prone notepad data collection process for making meter inspections with a faster and more accurate process using mobile GIS. 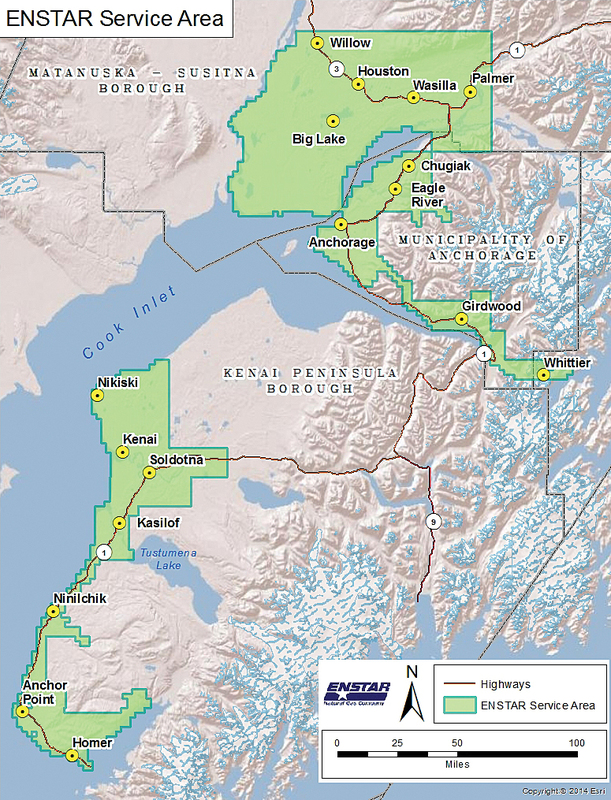 An Alaskan natural gas utility adopted a new approach to managing its tranmission network that developed an offline mobile GIS app that has improved the flow of information from the field to the office. ENSTAR Natural Gas has powered Alaska homes since the 1960s. Today ENSTAR serves a population area of more than 420,000 across nearly 3,000 square miles. Working in Alaska offered challenges, but ENSTAR had a working system for managing more than 450 miles of transmission main and nearly 3,000 miles of distribution main. 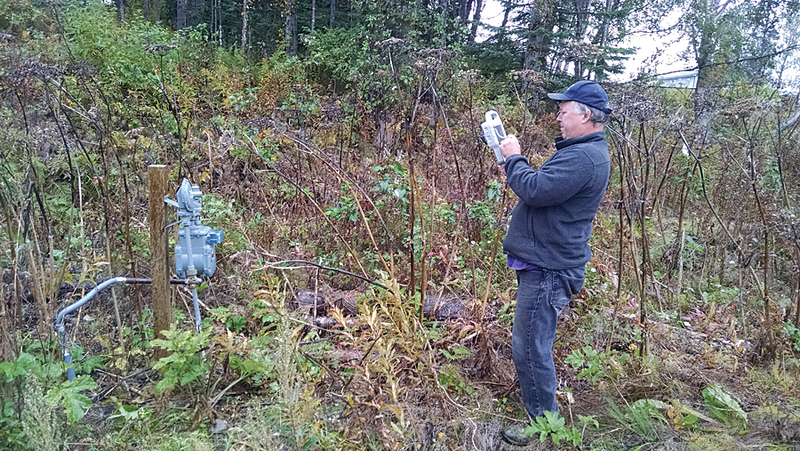 The utility limited inspection work to Alaska's summer months, May to September, and it used temporary workers who recorded fieldwork on paper maps and printouts. When workers installed a main or service line, they filled out a paper completion report. From these reports, ENSTAR made its annual update to its as-builts. So, true to the Alaskan spirit, ENSTAR was determined to explore another path. As part of ENSTAR's GIS strategic plan, the utility wanted to more rapidly collect GIS data in the field as well as the as-built updates in the GIS. ENSTAR also wanted to efficiently and accurately add meter information, which did not exist in the GIS. These changes would increase data accuracy while decreasing paper waste and eliminate time spent scanning documents. When ENSTAR rolled out its first modern data collection effort in 2011, the company had been using Esri technology for nearly five years. In the pilot program, workers collected atmospheric corrosion data using ArcPad on Trimble GPS units. Licensing costs and other challenges limited expansion of this application. ENSTAR was closer to digitizing data collection, but one more iteration was needed. ENSTAR contracted with Anchorage-based custom software developer Resource Data, Inc. (RDI). It is built on Windows for Mobile 10.2 and Windows Presentation Foundation (WPF). 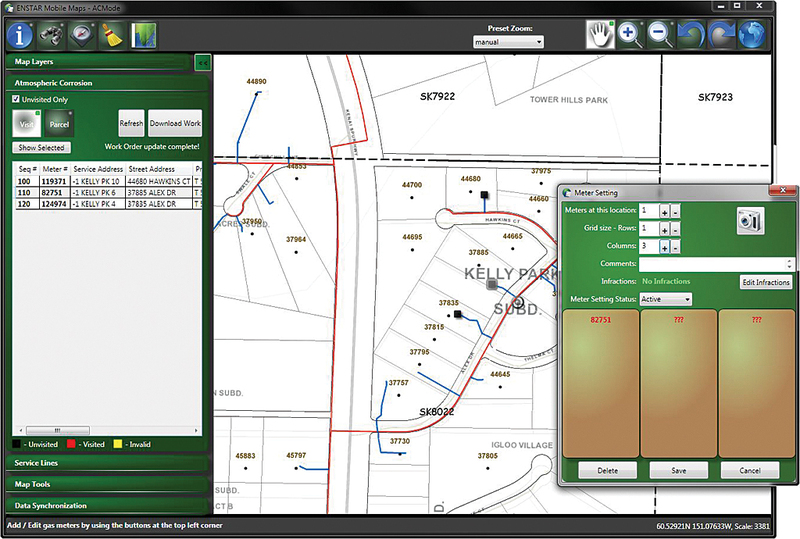 Using Esri's software development kit (SDK) and ArcGIS for Server Advanced, RDI developed a flexible app that included GPS tracking, camera capability, bar code scanning, and a document viewer. ENSTAR Mobile Maps shows near real-time meter information in the field. ENSTAR Mobile Maps was the result, and it was used in a pilot program in summer 2012 to carry out atmospheric corrosion inspections and meter data collection simultaneously. Mobile Maps leverages existing work processes. It is completely self-contained and doesn't require an Internet connection. It updates ENSTAR's enterprise GIS back at the office each day. Field-workers have found Mobile Map easy to learn and have required little training after initial adoption. Field-workers can edit maps in Mobile Maps. They enter meter information, record meter readings, and capture encoder receiver transmitters (ERTs) with the bar code scanners. With a click, they can enter everything ENSTAR needs to know about meter sets. ENSTAR Mobile Maps uses mobile and tile caches. Field-workers download new work assignments daily. In the field, they can pull up and sort work lists in a map or grid view, and the GPS can guide them to jobs. All editing is done offline. Fieldwork gets stored in mobile caches, which update through the app or through file synchronization at the office. ENSTAR synchronizes every day to avoid data duplication. Tile caches are updated through a manual file copy from portable hard drives. 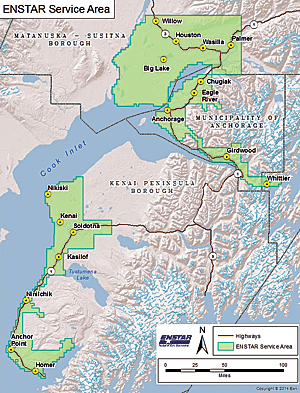 The ENSTAR service area spans southern Alaska. During its inaugural year of use, ENSTAR used Mobile Maps to inspect more than 34,000 meter sets. Field crews added more than 37,000 individual meters to the GIS. After the first year, a new module was added to the app that enabled a read-only mode for displaying map data for deployment to the service department. This replaced a legacy mapping application. The utility continues to phase out its paper as-built books and replace them with computer records. New modules are under development that will allow ENSTAR to digitize new service lines in the field and capture cathodic protection inspection data. Users like the app. The GIS is accurate. Work assignments are flexible. As-built data gets updated more often. Access to aerial imagery and scanned completion reports streamlines the workflow. Users can also locate all features within a selected polygon location. Meters are searchable. Each meter entered into Mobile Maps includes a picture. These time-stamped photos provide proof the meter has been inspected. The app won't close out a job until such a photo accompanies the meter entry. ENSTAR employees can search for features by address, subdivision, lot, block, or location ID. The search accepts wildcard queries. A Follow Me feature shows the user's location and the location of a feature chosen from search results. As the user approaches the chosen location, the map zooms in. "Through ENSTAR Mobile Maps we have been able to collect valuable meter location information and quickly turn it around for use by our service technicians and others in our company," said Erick Johnson, ENSTAR GIS specialist. Field crews have direct access to completion report documents in the field. For many jobs, workers no longer have to call in to the office to have someone track down a completion report and then relay the information on it over the phone. "It helps us identify and find meters which may need repair. As-built information can get out to the field more often, which increases safety," said Johnson. For more information, contact Erick Johnson.